Download this set of 3 free printable acorns & oak leaves vintage illustrations. These vintage illustrations are perfect for your fall decor! Happy Thanksgiving! I hope you’re enjoying the day with your family and friends. If you happen to visit The Birch Cottage blog today, I think you’ll love this set of fall prints I have for you today! If you’re a fan of Fixer Upper or the farmhouse style, you’re probably familiar with using vintage illustrations in your home decor. Although I’ve shared a lot of floral vintage illustrations here and here and here (you get the idea), I haven’t shared very many leaf illustrations. But, all of that is about to change! 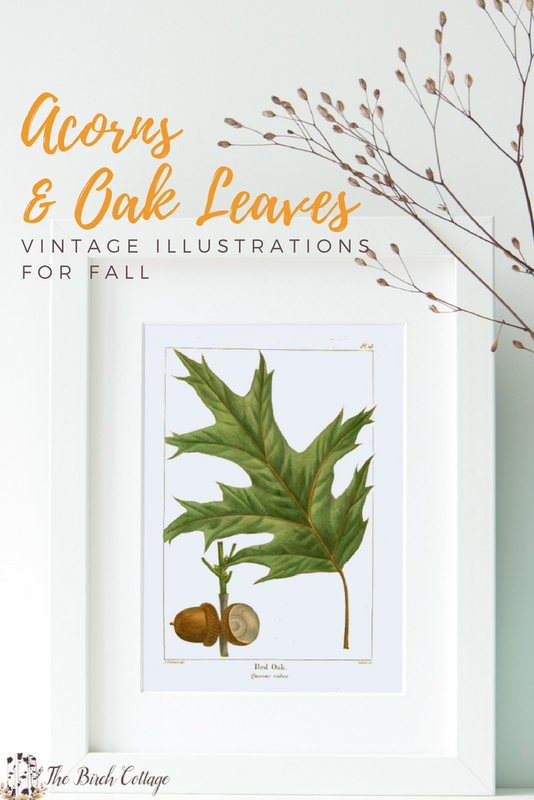 Today, I’m sharing the first set of acorns and oak leaves vintage illustrations with you. I’m working on another set of probably 5 vintage illustrations featuring oak leaves and acorns, but I don’t quite have those ready yet – soon though! I didn’t realize until I was searching The Birch Cottage blog for these prints that I hadn’t even shared them with you yet! So, before we get too far into the Christmas season, please enjoy this set of three acorns & oak leaves vintage illustrations. Then you just need to download the PDF file and save it to your computer. 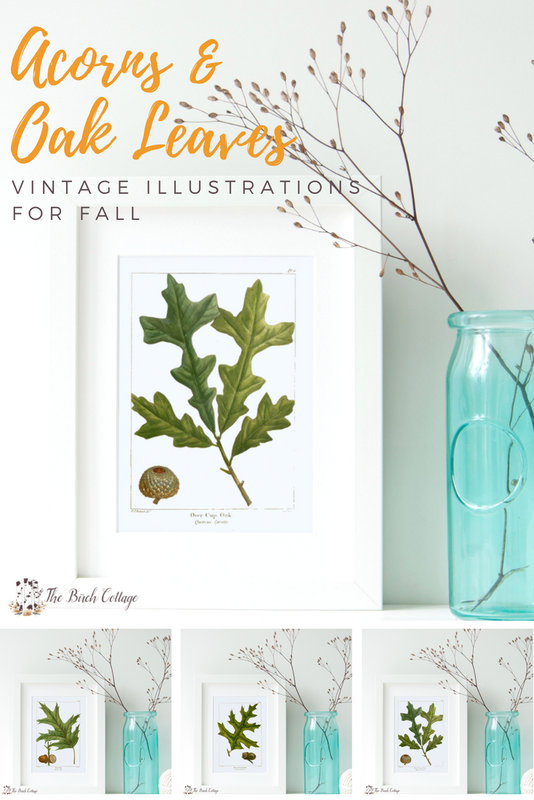 These acorns & oak leaves vintage illustration prints and all other free printables on The Birch Cottage are for your own PERSONAL USE ONLY. 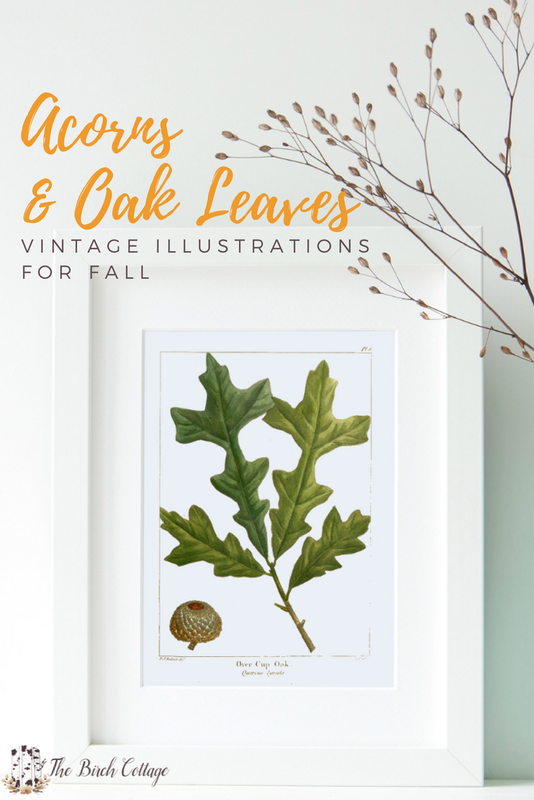 Sign up to get the free printable set of Acorns & Oak Leaves Vintage Illustration prints using the form earlier in this blog post. Then download the free PDF and print your preferred design. Remember, choosing the highest quality settings in your printer settings will give you the best quality print. 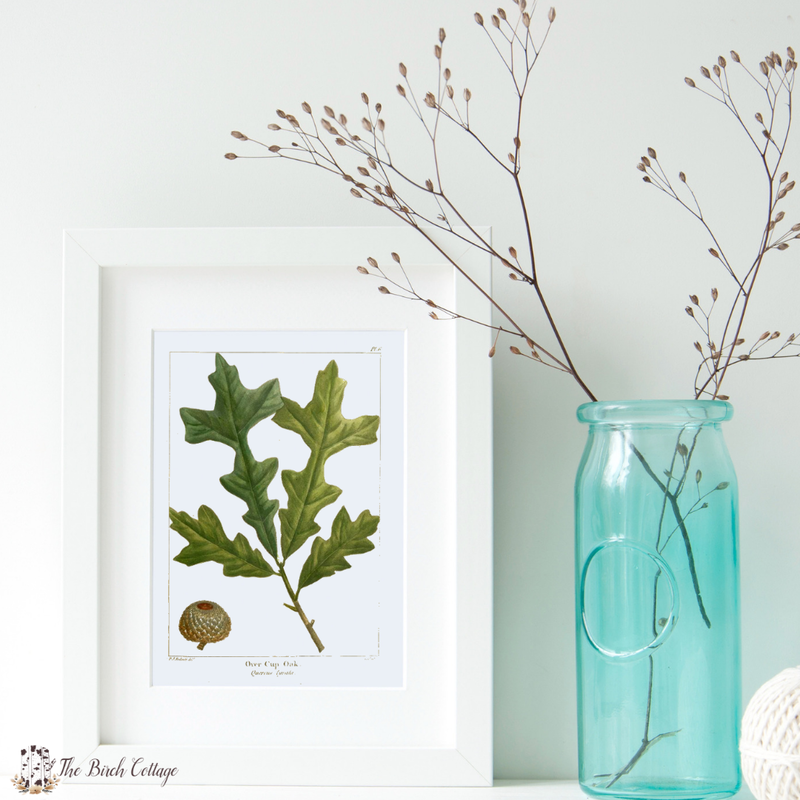 Once you’ve printed and trimmed your acorns & oak leaves print to the appropriate size, you’ll want to place it in a frame. If you’re using a matted frame, it may not be necessary for you to trim the print first. For even more vintage illustration printables, visit the printables page here. 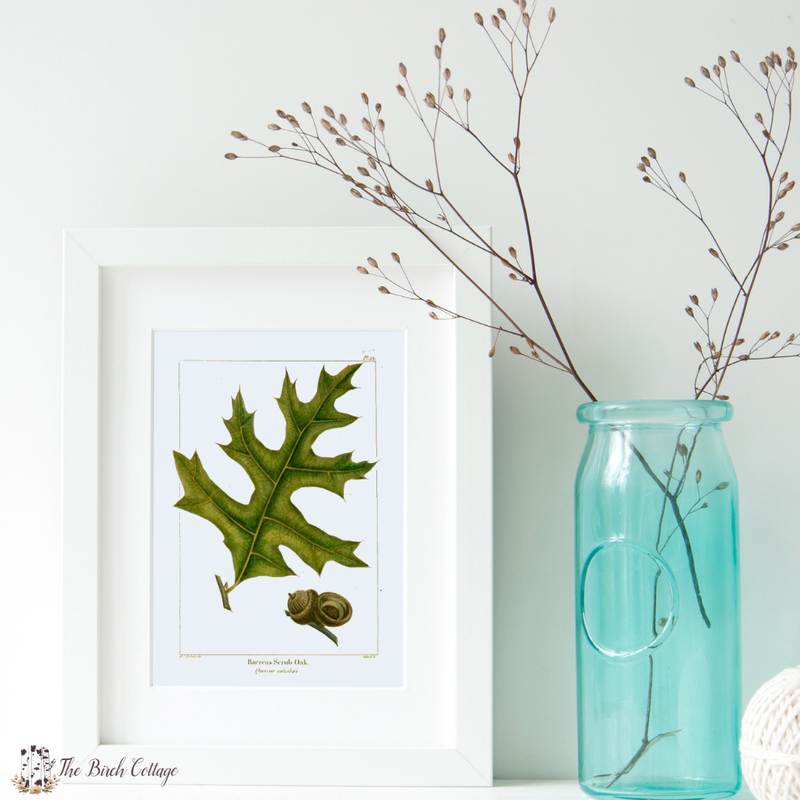 I hope you enjoy this set of Acorns & Oak Leaves Vintage Illustrations. If you need inspiration on how to use these prints, I shared some ideas here.